Although the stock market isn’t the most pleasant thing to look at right now, there are millions of people whose lives depend upon the ticking of those numbers. While those changing digits might not be of much importance to the average person, there are quite a lot of people whose job involves monitoring the stock market throughout the day. To them, there are a lot of resources available that help them do that. 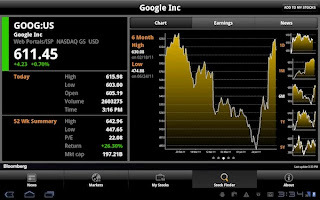 For example, there are stock market desktop applications, web apps and websites that show the latest stock market figures. However, as this is the age of smartphones, there are a few stock market apps that help achieve the same result with the added comfort of mobility. Bloomberg is one of the most trusted sources when it comes to financial news, updates and analyses. Android users can get the same experience on the phones by downloading any of their free apps. For those who’re looking for news, market data, and stock updates, there’s the basic Bloomberg app for smartphones and tablet computers. On the other hand, if you’re looking for a more professional coverage, there’s the Bloomberg Anywhere app, which, though free, is available only for Bloomberg Anywhere subscribers. The Bloomberg Anywhere app features real-time quotes, up-to-date market reports and many other features which are not there in the basic app. 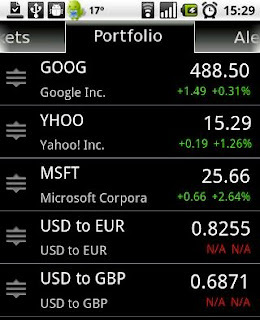 Overall, the Bloomberg suite of applications is one of the best and the highest rated stock market tools for Android. Developed by Google, this free app brings you streaming real-time quotes to your Android. It fetches the data from Google Finance and presents it in a nice-looking UI. You can view stock quotes, market updates as well as financial news. 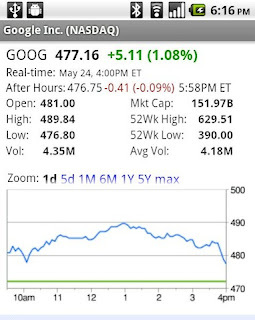 Definitely worth a try if you’re a regular Google Finance user. Despite having its own finance service, Google hasn’t managed to get as much success and popularity as Yahoo’s finance website, Yahoo! Finance. The site has been the staple of many finance professionals and enthusiasts for a long time. Bringing the site’s experience to your Android comes their official app. 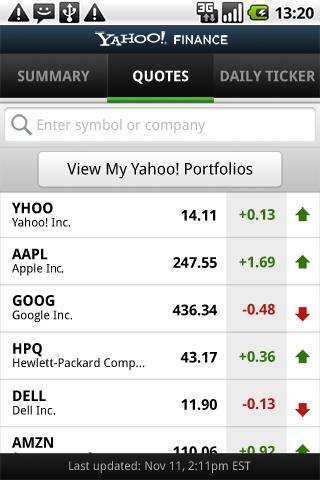 Simply titled Yahoo! Finance, the free app lets you view a daily market summary along with the latest finance news. 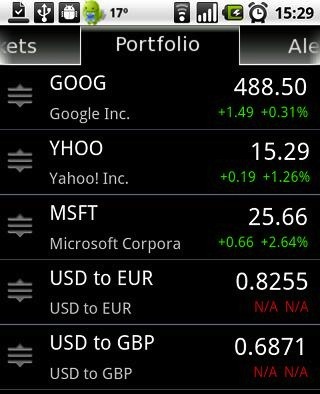 There are also detailed tickers for individual stocks that are presented in a nice and easy-to-understand format. Moreover, if you’re interested in a particular stock, you can add it to your ‘watchlist’ and keep a close eye on it. Summing up, Yahoo! Finance is a great app not just for the site’s fans but also for anyone who needs a decent and trusted way to keep in touch with the stock market. 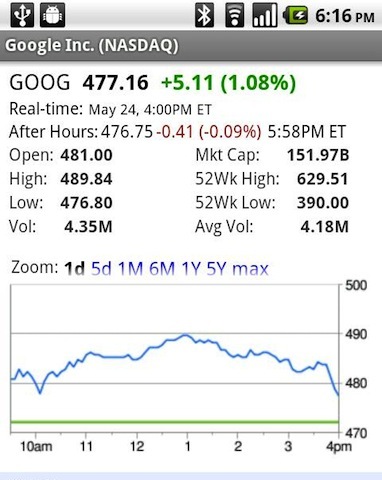 If Google Finance and Yahoo! Finance seems too limited for you, then this next app is just what you need. Packed with useful features like worldwide market support, analysis charts, technical indicators (ROI, RSI, MFI etc), StockWatcher is a free app that lets you get your daily stock market fix from your Android. 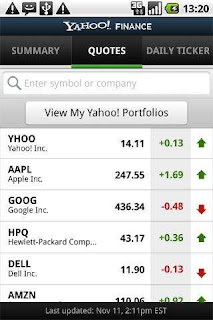 The app syncs with Yahoo! 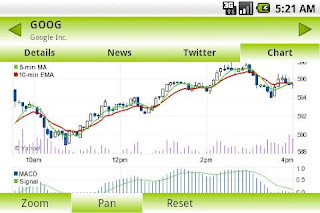 servers and brings up-to-date reports of the stock market. To add to the fun, there’s also a Twitter search functionality that lets you look up the latest updates about your stocks from a social perspective. One thing I particularly love about this app is that it allows users to add multiple Android widgets to the home screen. So, for example, if you want to stay in touch with Apple’s (AAPL) stock quotes, you can add a simple widget showing updated quotes about the company’s stock on your home screen. Similarly, you can add more widgets like that and fill your home screen with only the relevant stuff. With over 100,000 downloads so far, and a rating of 4.1 out of 5, StockWatcher proves to be an all-in-one stock market app that is perfect for stock enthusiasts who like to keep in touch with worldwide stocks. Okay, this app does more or less the same things that the aforementioned apps do. However, there’s one thing that makes it stand out from the crowd. 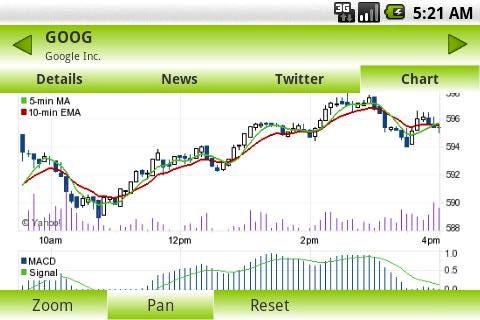 Stock Alerts comes with a feature that alerts you whenever your stock hits a particular price point. This is an essential feature that will prove useful for many stock investors and traders. The app is free and is rated 4.0 out of 5 stars in the marketplace. Unfortunately, except for Bloomberg app, all these apps do not support stocks listed in the PSE (Philippine Stock Exchange)!